Hibernate is a power-saving state that uses less power than Sleep. It works by dumping the content in RAM memory to disk, and then completely shutdown the computer, conserving the power but still allowing you to quickly return to where you left off, unlike Sleep state where computer is still powering the memory module to maintain the data inside it. Hibernate may not be available for all PCs, such as PCs with InstantGo. Hibernate is useful is your computer, especially notebook, laptop, tablet or hybrid, is low on battery, and putting it into hibernation can preserve the battery. When you have the charger to charge the battery, the computer can be turned on to its working state at the point of entering hibernation, allowing you to resume the work quickly. If you have no use of hibernation button in Power menu for reason such as accidentally put PC into hibernation, or you have added the hibernate to Power menu but now want to revert it, you can remove hibernate button or option from showing in the Power menu for all users in Windows. Power menu appears in Start menu, Start button, Power Users Win+X Tasks menu, log off screen, log on screen, Ctrl + Alt + Del screen and etc. Remove Hibernate from Power menu does not disable Hibernation feature. The device may still go into hibernation if power plan asks it to do so. Alternative, go to Control Panel -> System and Security -> Power Options. Or, right click on Power & Battery icon on the system tray of Taskbar, and select Power Options. If UAC prompts for conformation, click Yes to continue. Scroll down “Shutdown settings” section, and deselect the check box for Hibernate. That’s it. 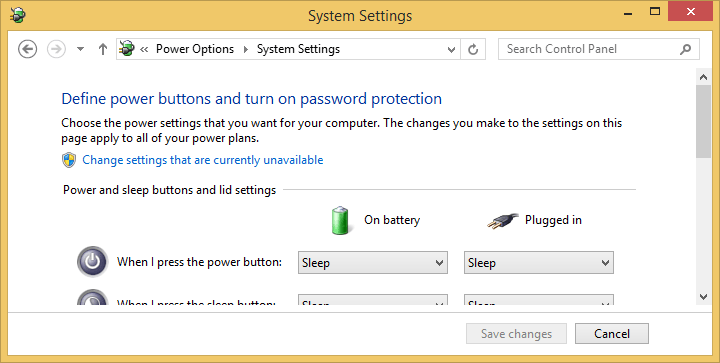 The “Hibernate” button or option is now removed from in Power Menu of Windows. The trick works in most versions of Windows, including Windows 7, Windows 8, Windows 8.1, Windows 10, Window Server 2012, Windows Server 2016 or later.